If you are a regular reader of my blog, you’ll notice that I like to cook dishes that are simple, easy to prepare, and readily adaptable to someone else’s tastes or needs. Well, this recipe is all of that, and best of all, it’s absolutely delicious! 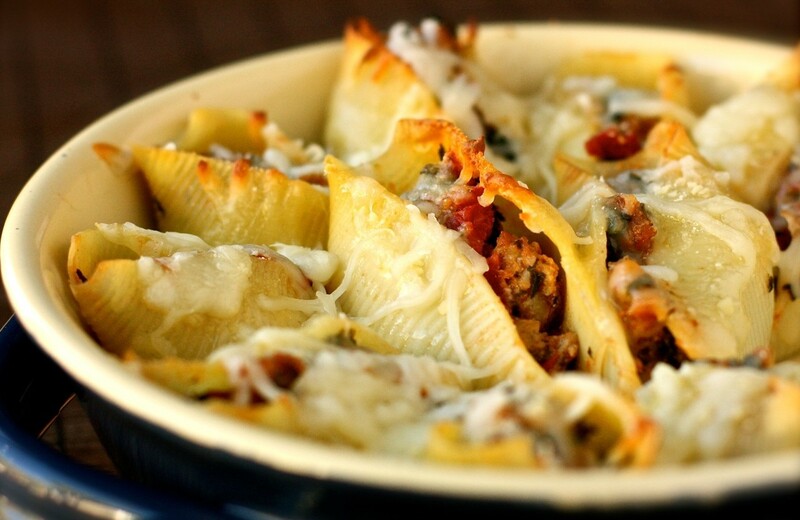 These baked sausage and spinach shells were exactly the type of food I wanted to serve my family and friends on Christmas Eve – finger foods that were filling and hearty. I was right because they were a big hit at my buffet table! The shells held the filling together so my guests were able to pick them up with their fingers and eat them without making a mess. I received compliments all night long. I used pork sausage links in the filling, but you may substitute chicken or turkey sausage or ground beef instead. In addition to spinach, you could also add mushrooms, bell peppers, or onions. I ended up using three different kinds of cheeses for this recipe – ricotta, shredded mozzarella, and grated parmesan. Use all three or keep it very simple with just ricotta and a sprinkling of mozzarella. These baked shells are versatile; you may serve them hot, right out of the oven or as an appetizer at a buffet table at room temperature. As a main entrée, add some some tomato sauce and a side salad and these shells would beautifully transform into a comforting dish, especially nice on a cold winter evening. Thanks to Joanne at my newest food blog discovery, Inspired Taste for this tasty recipe. Make an ice bath by filling a large bowl with cold water and ice, set aside. Bring a large pot of salted water to a boil. Add pasta shells and cook according to package directions. Drain well then add to ice bath until ready to stuff. 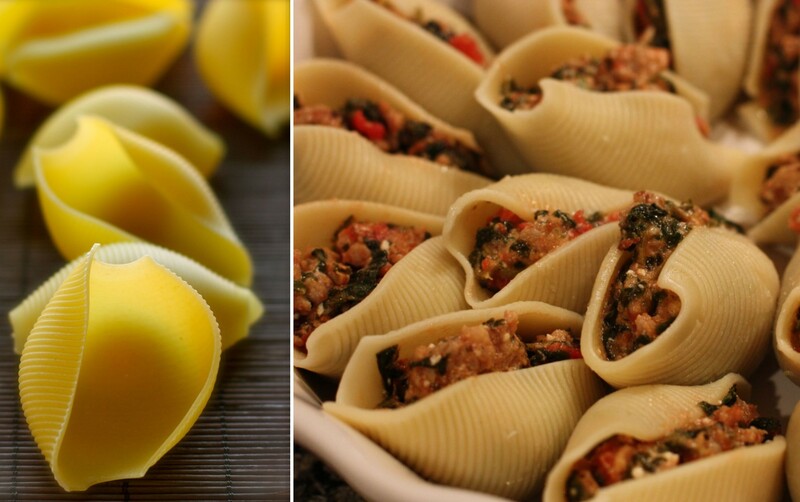 Using a spoon, fill pasta shells with sausage/spinach mixture and arrange in a baking dish (9-inch x 9-inch dish works well). Sprinkle the top with shredded mozarella and some more grated parmesan and then bake until cheese has melted and tips of shells begin to crisp and brown, about 25 – 30 minutes. *Note: I prepared the filling, up to this point, and covered and stored it in the refrigerator overnight. When I was ready to bake the shells, I reheated the filling, added the ricotta and followed the rest of the recipe. © Daisy’s World, 2011. All rights reserved. Unauthorized use and/or duplication of this material without express and written permission from this blog’s author and/or owner is strictly prohibited. Excerpts and links may be used, provided that full and clear credit is given to Daisy’s World with appropriate and specific direction to the original content. Welcome to my blog, Brittney! I’m glad you enjoyed the baked shells. P.S. your blog is awesome. Your photos are just amazing! I think this would be great meal to freeze. Do you? Hadn’t thought about it, but, I think so! Good idea. Versatility. Daisy’s definition: Turning conventional into creative! How often do we think of shells as, well, shells; an edible shape that can hold a filling one can safely hold in the hand while chatting with guests. I am not surprised these were a big hit. Sounds like you had a joy-filled Christmas Eve. Wishing you an equally festive and creative New Year. These look festive. I like it that you eat them as finger food. Beautiful job on these shells…they look just amazing. Yum. Total comfort food. Like tasty little mini-cannelonis!